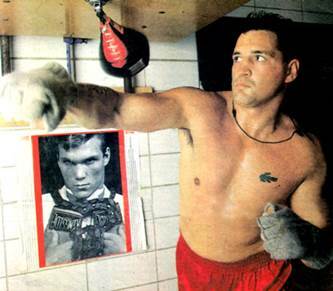 Craig “Gator” Bodzianowski, a champion boxer and inspiration to millions, has died. He passed away at 52, in his sleep Friday, July 26. Mr. Bodzianowski made one of the greatest professional sports comebacks of all-time. He was an up and coming cruiserweight boxer in the early “80s,” on his way to becoming a contender when he had a motorcycle accident which resulted in the amputation of his lower right leg. Gator defied all of the critics and naysayers to become the toughest man who ever stepped into the ring by doing it on a prosthesis. Not the best fighter but the toughest. He recaptured his winning ways as a slugger and by refusing to ever quit. With 103 amateur and professional fights, he won 94. No one ever stopped him; he finished every fight. To the amazement of fans, Mr. Bodzianowski went on, fighting with his prosthesis, to win the Illinois Heavyweight Championship and the Intercontinental America’s Cruiserweight Championship. Eventually he won the right to fight for WBA World Championship belt. Suffering two broken ribs in the second round, he still managed to finish the fight, ultimately losing by a few points. Mr. Bodzianowski inspires all who are physically challenged everywhere. “Gator” is survived by his children Kenneth Gator and Paige Margaret, mother Gloria, sister Denise Worley (Stephen) and brothers Howard (Kristen) and Kenneth (Christine). Preceded in death by his father, Patrick, brother William and sister Donna Tamberlin. Proud Uncle of Jeff ,Bruce, Frank, Pat, Bill, Kenny. After retiring from boxing, Mr. Bodzianowski went onto physical training and construction work. Later he graduated with Honors from Le Cordon Bleu Culinary School and became a professional chef. A memorial service will be held at Brady-Gill Funeral Home 16600 S. Oak Park, Tinley Park, 60477, Wednesday, July 31, 2013 from 2 P.M. until 9 P.M.